I’ve talked before about over-processing my hair to within an inch of its life and the difficulties I’ve encountered trying to find a happy compromise between routinely covering my greys and keeping my hair in a healthy condition. Well, I’ve found the answer. Almost. It’s not completely perfect… but it’s close enough for now. 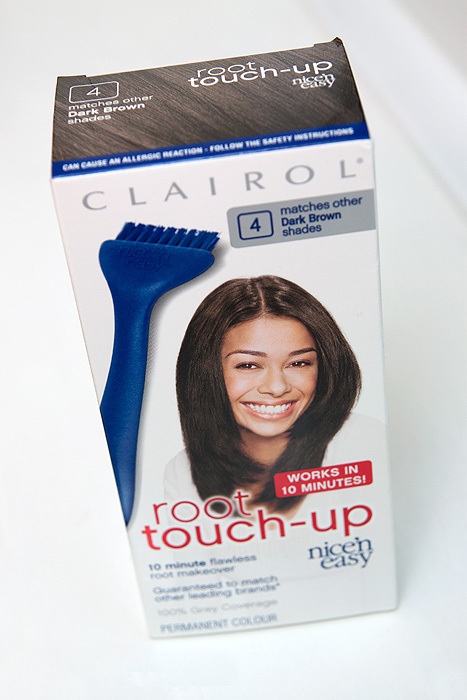 Clairol Nice n’ Easy Root Touch Up. There’s something about paying the same amount of money for LESS product that kills me everytime I approach the counter to pay for this box. The dye is intended only for use on your roots (you don’t say…), hence you get less in the pack than you would normal hair dye. It’s not that it’s phenomenally expensive, infact, it’s really good value but compared to my Superdrug own brand Choc Brown that I’ve enjoyed using previously, it is a small step up in price. However, it’s a little box of awesome. I pick up shade #4 which claims to blend with all manner of dark browns and I will absolutely back those claims. It’s never looked at all out of place alongside my older dye jobs and really does blend quite seamlessly. It only takes 10 minutes before I jump in the shower and rinse. The entire process is completed in under 20 minutes and because it doesn’t go anywhere near the ends of my hair, is a lot less messy than usual! My only caveat is that I’ve seen a couple of photos of myself recently (where I’m trying to take snaps of my curls etc..) and I can see a bit of grey peeking through the roots toward the back of my head. It’s probably been about 4 months since they’ve last been dyed and I either need to grab a normal box dye (which I don’t want to do) or get Mr. L to tackle the harder to reach areas with an extra pack of this stuff. Better solution I think. Either way, my ends are getting some MUCH needed respite and my overall hair colour is looking beautifully natural and non-blocky. This is great stuff! However, I find that I need a root touch up every 2-3 weeks, depending on hair growth, and I visit the salon every 5-6 weeks. I need to get a box of this now. I’ve promised myself not to keep doing my whole head but I’m nervous. The colour on the rest of my hair has faded a bit and looks a touch orangey. Nice! I take it that you don’t do the roots all over from what you’ve said. Just the visible ones? I wondered about the back too. Maybe I could employ the service of a friend to do the back occasionally. I’m not sure my husband is to be trusted! i used this all the time when I died my hair red. It matched so extremely well and made the color richer when I dyed it. Great product. I used to use this to cover my blonde roots after going dark – it’s great! The brush is so much easier than the normal nozzle. However, like Jamilla, I also needed to use it every 2-3 weeks, which made it possible for me to stretch the dyeing interval to the recommended 7-8 weeks. Why don’t you just use a box of your normal dye and just make up half the quantity? You’d have more than enough then to do all the roots sections, front and back. That’s what I do and never had a problem, you just mix in a separate bowl (I use a takeaway container). I just apply it with my fingers but you could save the brush out of one of these. Saves paying a fortune for a tiny bit of dye, what a waste of money! I just dyed my hair, the whole thing, but the instructions in it told you how to do it for just root touch up if you wanted to. So like Mel suggested, you really don’t need a special for roots only product and this way you could do the back too (or your husband could).